Combine the first five ingredients and stir well in a bowl. Heat oil in a small but deep saucepan on medium heat. Add sesame seeds for 10-15 seconds. Add the sauce and cook 5-6 minutes on high heat until sauce thickens a bit. Stir to prevent burning. Cool. Taste and adjust seasonings. Add some honey for more sweetness, more vinegar and Gochujang if required. Heat oil in medium size kadai or wok on high heat. Sift cornflour and rice flour together with a pinch of salt. 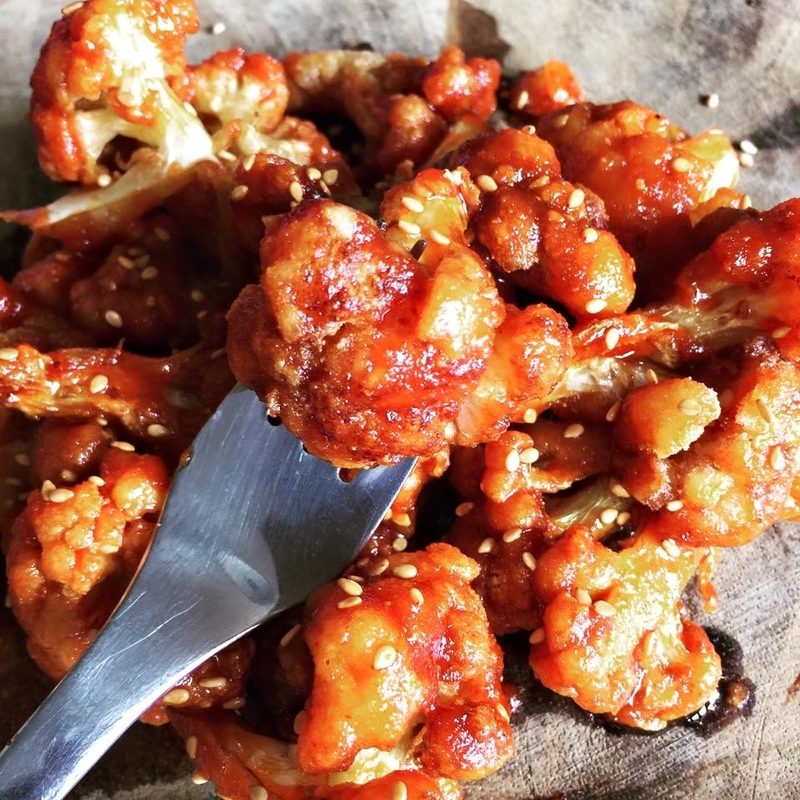 Roll cauliflower in it until each florets are dredged in the flours and fry in hot oil until golden and crispy. Drain completely and toss with sauce. Serve immediately. Soak chickpeas and cracked wheat in excess water overnight. Sift baking powder, salt and flour together. Stir in all dried spices and reserve. Drain chick peas completely. Wipe dry with a clean kitchen towel. Pulse onions and garlic cloves in the food processor until you get coarse bread crumbs. Do not add water and do not grind to a paste. Add drained chick peas and grind again to get a coarse breadcrumb consistency. Put ground chick peas in a large mixing bowl. Add the mixture of flour, spices and baking powder and mix together manually until the mixture gets clumpy and you can shape them into balls. Add coriander leaves and mix well. No water is required. If you are finding the mixture is not holding together add some more flour. Heat 3 inches of vegetable oil in a Kadai or deep skillet on high. When oil is hot but not smoking fry one ball. Lower the ball into the oil and reduce heat immediately to medium. Fry till golden brown. Taste for flavor and doneness. Add more salt and spices as required. 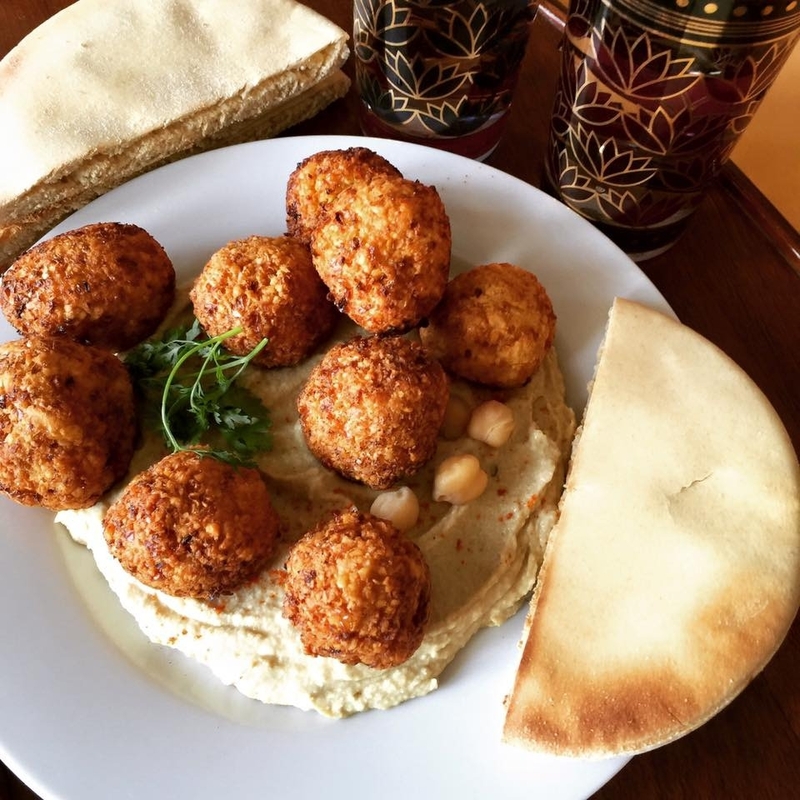 Drain fried Falafels and serve with hummous, warm pita, babaghanoush, tabouleh and any other condiments you like. My paternal grandmother would make this cake. I don't know where she got the recipe from but it was a piece of type writer paper that she kept folded inside her book of desserts. As kids we always wanted to know how the chocolate got to the bottom of the cake without merging with the rest of the cake. I still don't know! As kids we enjoyed it with the rich nut topping. Nowadays I like it just as is with a few nuts for decoration. Stir the chocolate until melted into the boiling water or coffee. Then add cream and mix well. Reserve. Beat the butter and sugar until fluffy. Add vanilla and then eggs one at a time and incorporate well. Add the milk and continue beating. Mixture will look separated and grainy. Pour into pan of your choice. Bang the pan against the counter so as to settle the batter. Using a tablespoon make a small groove about 1/4 inch deep in the center of the cake that runs all the way round if using a Bundt pan- like a tunnel or a moat, or all along form end to end if using a tube pan. Part this tunnel a little with your tablespoon. Pour the thick chocolate sauce into the moat slowly all the way around the cake. Carefully place the cake the oven and bake 25 minutes. Remove foil and bake another 50 minutes until a toothpick pushed into the center of the cake comes out clean. Cool cake an hour and a half before unmolding. Melt butter, salt and chips in a small pan on low heat. Stir in toasted nuts. 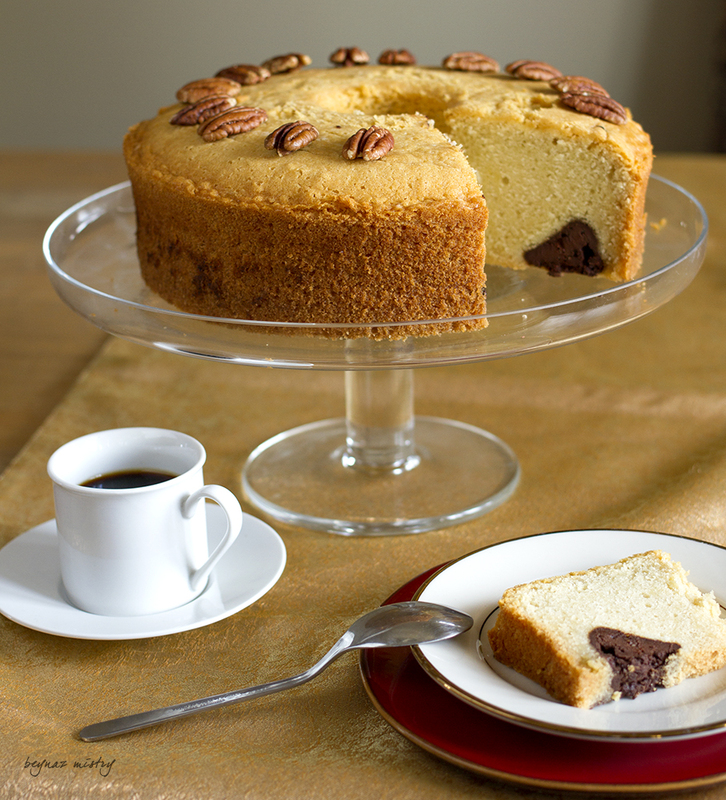 Spread in clumps across the top of the cake and spread gently with a spatula. Keep cake covered after you serve it. Set 2 liters water to boil in a pot. Stir in half a teaspoon of salt. Puree the mustard, green chillies, oil, yogurt, ginger garlic, Garam masala, turmeric, onion and 1.25 teaspoon of salt and 1 tsp sugar in a food processor to a smooth paste. Put this masala in a thick bottomed pot on a medium flame and cook 15 minutes until the yogurt splits, oil separates from the mixture and it bubbles. Cool. When water in boiling plunge the cauliflower florets in the water and switch off flame. Drain in 90 seconds. Do not overcook the cauliflower.Drain completely. Mix the cauliflower with the cooked yogurt sauce until well covered. Place the cauliflower on a well oiled tava or heavy bottomed skillet with the capsicum and tomato pieces arranged between the florets. Heat a single piece of coal over a flame. When it lights up and begins to smoke place it in the center of the cauliflower. 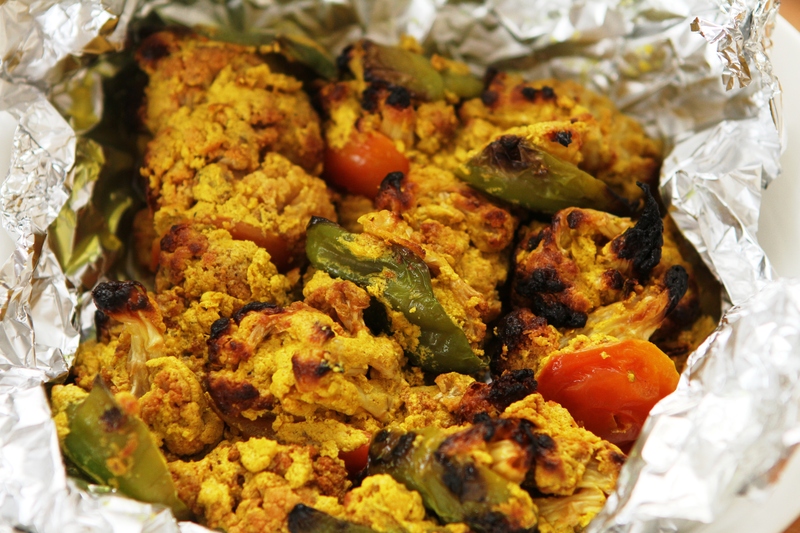 Cover loosely with foil and cook on a slow flame until cooked through. Stir and toss every 10 minutes and sprinkle a little water if the bottom dries up. Towards the end increase the flame to high and let some of the pieces brown at the edges. If using an oven preheat to 350F. Grease the baking tray generously, arrange the cauliflower pieces in the center with the quartered tomato and bell pepper, place the smoking coal in the center of the cauliflower then cover the baking tray with foil and cook in a preheated oven at 350F until golden brown. Open foil for a few minutes, remove the coal and broil at 550F to get a smoky flavor and slightly crispy edges. Taste for salt. Serve hot with flatbreads of your choice or dal and rice. HEAT 1 TEASPOON OIL IN AN 8 INCH WIDE NON STICK PAN OR HEAVY BOTTOMED SKILLET. SAUTE EACH VEGETABLE ONE AT A TIME UNTIL SOFT AND FRAGRANT. SPRINKLE EACH VEGETABLE WITH A TINY PINCH OF SALT AS IT COOKS AND ADD A TEASPOON OF OIL FOR EACH VEGETABLE. ITS IMPORTANT TO DRY THE VEGETABLES OUT. RESERVE EACH VEGETABLE IN A SEPARATE CONTAINER. WHISK EGGS, MILK, BASIL AND HOT SAUCE TOGETHER. STIR IN EGG PLANT. POUR REMAINING OIL INTO THE SKILLET AND HEAT ON A LOW FLAME. SWITCH OFF FLAME AND POUR EGGS INTO IT. LET EGGS SETTLE. SPRINKLE WITH CHEESE. THEN THE DICED AND SAUTEED RED BELL PEPPER AND FORM ANOTHER CIRCLE INSIDE. FILL THE MIDDLE WITH THE LAST BELL PEPPER. PUT THE TOMATO IN THE MIDDLE. SPRINKLE WITH CRUSHED BLACK PEPPER. AS THE BOTTOM OF THE OMELET COOKS USE A SMALL SPOON AND DIP INTO THE BATTER. SHAKES THE SPOON A LITTLE SO THE UNCOOKED BATTER ON TOP DRIBBLES INTO THE BOTTOM. THIS WILL HELP THE OMELET COOK THROUGH. IF YOU USE AN OVEN THIS STEP IS NOT NECESSARY. WHEN THE TOP OF THE OMLET LOOKS MOIST BUT ISNT RUNNY. SWITCH OF FLAME. 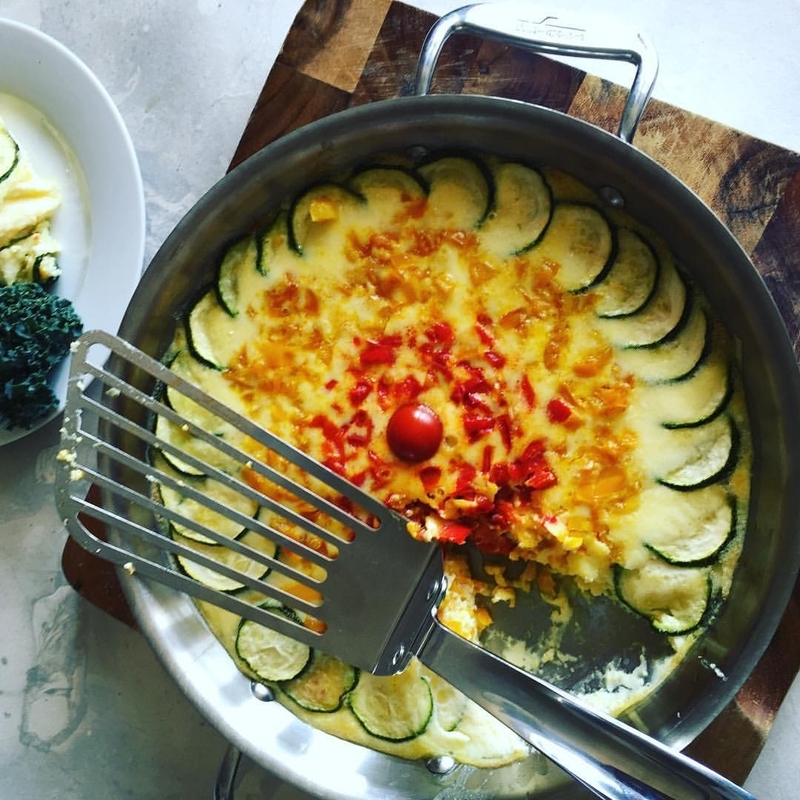 SERVE THE OMLET IN THE SKILLET OR SLIDE IT ONTO A SERVING DISH. SERVE WITH A GREEN SALAD AND A SLICE OF GOOD QUALITY BREAD LIKE BAGUETTE, BRUN OR GUTLI FOR A COMPLETE MEAL. This is an easy eggless cracker recipe that produces a buttery cracker you will crave. Preheat oven to 350°F. Prepare two trays middle and low by lining with wax paper. Pulse cheese, flour, butter, salt, and cayenne in a food processor until mixture resembles breadcrumbs. You can also do this by hand using a fork. Add milk and pulse or mix until dough forms a loose ball. If dough is too dry or too sticky add a little more milk and flour as required. The dough should soft but pliable and easy to roll. Divide dough into 2 portions and keep covered with a clean damp cloth. Flour a clean, flat surface generously with flour. Roll out half the dough with a lightly floured rolling pin into a 5 by 6-inch rectangle (about 1/6 inch deep). Flour a pastry cutter, sharp knife or pizza cutter lightly and cut into squares of your choice. Or a small one inch cookie cutter if you want round or heart shaped crackers. Carefully transfer to lined baking trays. There should be a small space between every square to prevent sticking. using a fork gently prick each square. This will reduce puffing. Bake until light golden 15-17 minutes. Switch racks over half way through to ensure even baking. Cool completely on baking sheets on racks, about 15 minutes. Serve as is or as a canape with a variety of toppings such as olive tapenade, goat cheese, etc. These crackers are wonderful as is but can also be used as a canape base for drier toppings. As they are brittle they shouldn't be used to dip. You can replace mild cheddar with sharp cheddar and throw in some blue cheese, dried herbs or cracked black pepper instead You could also used a spicy cheese and omit the chilli powder. This recipe will give you 10-12 2-2.25 inch long pieces and one cup of hot chocolate. Recommended 2 pieces per person. Please consult your doctor if you have allergies or medical needs before enjoying this recipe. Churros is a small, long, ridged and fried pastry. i make them bite sized but you can make them longer, even pipe them as rings. It's very easy to make, which is why it's an excellent addition to your -'I need a -make it express, crowd pleaser', recipe collection. My Churros recipe is vegan- no eggs and no milk. You can serve it with a vegan version of hot chocolate if you prefer- directions and ingredients are included. Churros are also known as known as Tejeringos. They are generally piped from a star shaped nozzle but if you don't have one I wouldn't let it stop you! The origins of Churros are undetermined and theories abound but its often associated with Spain, Portugal and the Americas where it is served with cinnamon flavored Mexican chocolate, champurrados (a corn based chocolate drink), cafe con leche, even dulce de leche.. In uruguay it is a savory dish served with cheese. Mexican chocolate is flavored with cinnamon. If you don't have Mexican chocolate at hand use a stick of cinnamon to flavor the cream or coconut milk. Heat sugar, cream or coconut milk and a stick of whole cinnamon in a medium saucepan on a low flame until sugar has dissolved and liquid reaches a boil. Switch off flame and remove cinnamon stick. Stir in grated chocolate of your choice until smooth. Reserve. Add more sugar to taste if using a darker milk free chocolate. Sift flour and baking powder with 1/6 tsp salt. Reserve. In a small saucepan on medium heat, stir together water, 2 1/4 tablespoons sugar and 2 tablespoons unflavored vegetable oil. Bring to a boil and switch off flame. Stir in flour mixture and mix vigorously to form a slightly sticky ball. The dough will be sticky but firm and pliable. Prepare a piping or pastry bag. Use an 8mm star shaped nozzle. If you don't have one don't worry use a similar sized nozzle. If you don't have a nozzle and piping bag just fill the dough into the corner of a ziploc type bag, snip the end about 8-10 mm and squeeze. Nothing should stop you from making and enjoying this dish. If all else fails just make small half inch round balls. Heat 2 inches unflavored vegetable oil for frying in 6 inch wide deep saucepan or kadai on high flame. When oil is hot but not smoking lower flame to medium. Introduce a small piece of dough into the oil. If oil sizzles and dough rises to the top oil is ready for use. Pipe strips of dough about 2.5 inches long into hot oil using the pastry bag or a small food safe 'ziploc' type bag snipped at the end. Fry until golden then drain on paper towels. Let cool about 5 minutes. In a 6 inch wide bowl stir together 1 cup sugar and cinnamon. Roll drained churros generously in cinnamon and sugar mixture. Serve immediately with a small cup (I use an espresso cup for 2) of warm, cinnamon hot chocolate. if you are serving a larger group, put all the hot chocolate in a single bowl or cup and serve with churros on a larger serving platter like a Chip and Dip.